Replaced by the Yealink T21P E2 on this site. 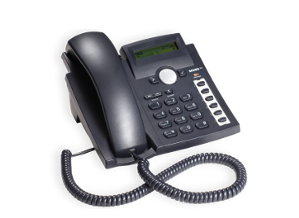 The Snom 300, fulfils the most important requirements of VoIP telephony and additionally offers numerous functions that are indispensable in the business world. For effective everyday work, the Snom 300 provides all relevant office functions such as choice of trunk line, status display, group lines, the engaged option or picking up calls. A server-independent CTI now also works with the Snom 300.